Barbara supplements her article on UKS-1 and the Terzan Globulars with her observations of other obscure globular clusters, including five of the most remote Milky Way clusters, located in the extreme outer halo of our galaxy. This cluster is an outer halo globular like Pal 3 & 4. It is also similar to Pal 14 in that it is the 2nd intermediate metal abundance cluster in the outer halo. 3 faint stars seen at position. 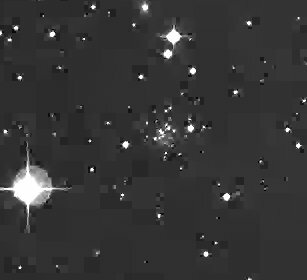 Do not believe the cluster was seen, but later checking the POSS the three stars I drew are in the cluster, so I feel I may have seen it but would like to try again this winter. 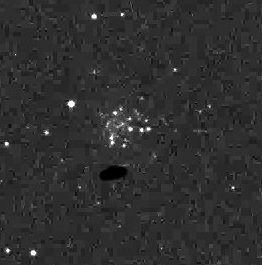 On my second attempt, 3 weeks later, the cluster was visible as a diffuse round glow using 5mm Clave eyepiece. Sky conditions much better than first try a few weeks ago. This object is not marginal for a 20" but requires excellent transparency. The Intergalactic Tramp is the 5th most distant globular cluster and one of the 6 extreme halo globular clusters. Brightest stars are 17.3; V(HB) is 20.4 magnitude. It is a small round nebulous glow. No stars seen. 2' from 3 stars which form a shallow triangle. No resolution. A dim distant object about 2' in size by my estimate. 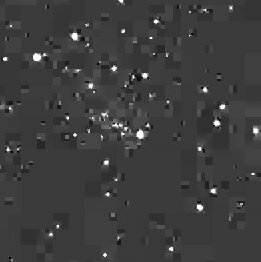 Reobserved from Columbus Texas 4/2000 with 20" f/4 (seeing 7 transparency 6.5): Cluster was slightly granular in that it showed faint sprinkling of stars at best moments of seeing. 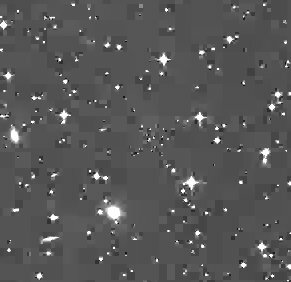 Using Digital Sky Survey image was able to confirm 2 stars at edge of cluster that I saw clearly. Palomar 14's location is exactly as on MegaStar chart. Easy to locate as a bright star is close by. Not nearly as difficult visually as Pal 15. Though its listed mag is fainter, Pal 14 has a higher surface brightness than Pal 15. Seen as a diffuse soft round glow, with no brightening to its middle, and no hint of any resolution. But the edges of the globular are fairly strong against background sky. 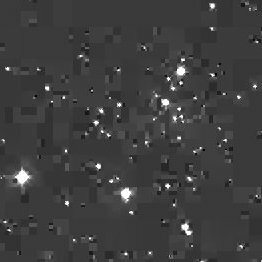 According to Skiff, brightest stars are 17.6 mag and horizontal branch magnitude of stars in the cluster is 20.06 One of most distant globulars from the Sun. Discovered by H. Arp. No reported observations. Note that this cluster is incorrectly plotted 7' W on most atlases due to an error in the original discovery coordinates. 29.2 kpc makes this a very distant object. AM 4 is a low luminosity low metallicity globular with a total mass of 1000 suns. This is the faintest and least massive globular known in the galactic halo. 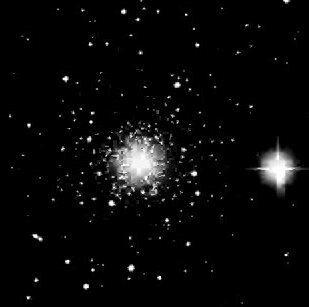 This globular cluster is near (20' in distance from) NGC 6520 (OC) and B 86 (Dark Nebula). Cluster is centered in a keystone of 4 stars resembling the keystone of Hercules. 3 of the 4 stars are 10th Magnitude. The southern star is 8th magnitude. The NW star of the keystone is double. The globular fills almost 1/2 of my 7' field so is about 2.5' in size. 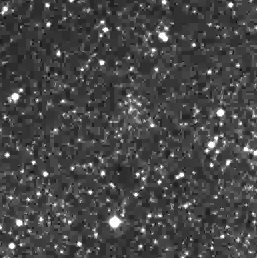 Grainy in appearance with a dark delineation around it - 2 stars resolvable at outer perimeter of glob -foreground stars? Amazing bright globular discovered in 1987 by Djorgovski. Appears to be near 11th magnitude overall visually. Also catalogued as ESO456-SC38. Newly discovered in 1995. Faint but clearly visible as a round evenly illuminated glow with no resolution even at 450 power. It was found exactly at discovery coordinates. 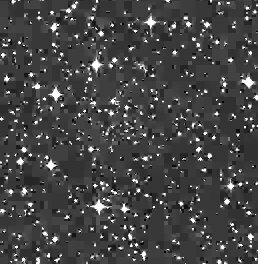 Inside of a sideways "V" shaped asterism of stars.